Dr. Harvey Montijo is the founder and board president of The Center for Bone & Joint Surgery of the Palm Beaches. He is a board-certified orthopedic surgeon and total hip and knee joint replacement specialist. Dr. Montijo has extensive knowledge in the latest surgical techniques, and he trains surgeons around the world, as well as in the United States. He serves as the medical director of Total Joint Center at Wellington Regional Medical Center, member of the Board of Directors of Wellington Medical Regional Center, and founder of the Optimal Wellness and Longevity Institute. 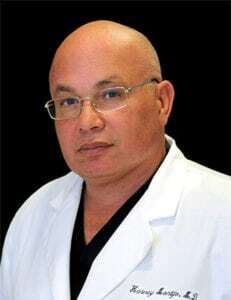 Dr. Montijo earned his medical degree from the University of Puerto Rico. A veteran major of the US Army, he completed his surgery internship and orthopedic surgery service at Eisenhower Army Medical Center at Ft. Gordon, Georgia. As a student, Dr. Montijo was a member of the dean’s list, as well as a four-year judo state champion in Puerto Rico and a gold and bronze medal winner at the Judo Central American Games. Dr. Montijo is a member of the American Academy of Orthopaedic Surgeons, American Orthopaedic Association, Society of Military Orthopaedic Surgeons, Palm Beach County Medical Society, Honorary Member of Panama Orthopaedic Society, Latin American Medical Association, Florida Orthopedic Society, and American Medical Association. Dr. Montijo’s research is published in several peer-reviewed medical journals, and he is a sought after national and international presenter. In his leisure time, Dr. Montijo enjoys jogging, weight lifting, and golf. Find out what Dr. Montijo’s patients are saying about his quality orthopedic care.